Cycling computers are all the rage, and are used to provide riders with the information and data needed to track and improve results. One of the latest and most popular modules this year is the Garmin Edge 520. Offering plenty of new features and innovations over the game changing edge 500, the new edge 520 has plenty of features that will become must haves for every cyclist. What’s New in the Garmin Edge 520? Live Strava Segment Integration: Designed to push riders to make personal records, the Garmin 520 now integrates with Strava and allows riders to set featured segments on your ride. Once set, it will live track your stats, while also giving you the opportunity to compare it against your personal records. This is a step forward as previous Garmin cycling computers did not integrate with Strava. Bluetooth Phone Integration: A great tool for riders looking to still have access to their phones while they ride, the new edge 520 offers complete Bluetooth integration, which provides smart text and call notifications. The Bluetooth connection also gives riders an option to upload and track their stats live. Recover & Performance Metrics: As is the case with other Garmin cycling computers, you rely on them for their in-depth metrics including speed, pace, power and more. A new feature to the Garmin 520 is your V02, or oxygen levels, and recovery time. Your Garmin will actually offer you an estimate as to how many hours of rest you need to recover from your ride. Garmin Integration: Another fun feature that comes with the Edge 520 is the ability to control add-ons including your Garmin Varia bike lights and your Varia bike radar system. If you’ve gone all in on Garmin products, it is nice to be able to control them all with ease from your new computer. There are plenty of other features that make the Garmin 520 one of the most technologically advanced on the market, but the above are definitely the highlights of the upgraded system. Not only are you enjoying the ease of tracking your ride, but also you now have the ability to train and improve at the same level as some professional riders. With a Garmin Edge 520 bundle you can take your new cycling computer to another level. While the basic model comes with the computer and a mount, the Garmin Edge 520 gps cycling computer bundle includes a premium heart rate monitor, cadence sensor, and a speed sensor. The premium Garmin heart rate monitor allows for more accurate measurements that will provide you with a better understanding of how hard your body has to work to produce specific numbers. 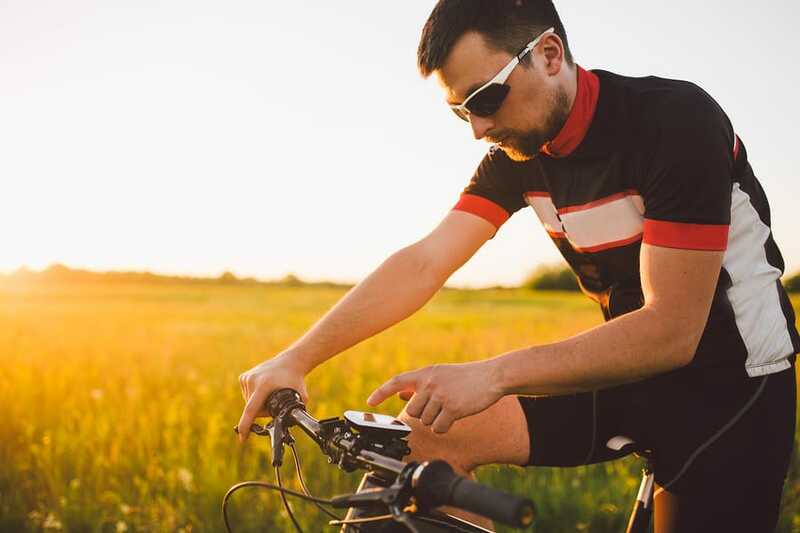 This is especially helpful for cyclists training for a race or someone with a medical condition looking to continually monitor their heart rate as they ride. Also included in the cycling computer bundle are the cadence sensor and the speed sensor. The speed sensor attaches to your wheels and gives accurate measurements for speed and distance. This can be particularly helpful for stationary training as the sensor continues to monitor the speed even without the bike moving. Like the speed sensor, the cadence sensor can easily attach to your crank arm and keeps track of your pedaling cadence. This gives you a look at your pedal strokes per minute, which can help you adjust and improve overtime. The benefits of the Garmin edge 520 GPS cycling computer bundles are vast, but they are rooted in the essential benefit of improvement. By tracking and cataloging the various stats of your ride including speed and heart rate, you can push your body harder while also taking actual data to mark improvements. While the Garmin Edge 520 provides plenty of innovations as it pertains to data analytics, it also continues to do what Garmin does best, and that is GPS tracking. With the Garmin Edge 520 GPS cycling computer, you will never be lost on the road. You can live-track your position with its newer technology. This is a great benefit for bikers hoping to offer loved ones or friends a look at the amount of miles they’re putting in a specific ride. GPS tracking also offers the benefits of providing vital information in the event of an accident or fall. With the new Garmin 520 you can also update your computer with external maps allowing for the most up to date information possible.